With applications like diecast machines, extruder lines and other machinery employing process water, type ICW is used for general machine protection, and type Safety is used for personnel protection. The systems monitor intake and output of process water at the mould regulator (Safety) or where the machine interfaces the process water supply (ICW), and will detect leakage if a hose bursts or a coupling or fitting is leaky. The systems will cutoff the water intake and request shutdown of machine and mould regulator. Using type ICW, diecast machines may run unsupervised production stints without risk of lengthy water leaks. If oil and traverse coolers are supplied from the same connection as the regulator, type ICW will monitor these as well. The Safety system is designed to counter the risk of scalding of personnel and operators in the event of a leak in the mould circuit, and therefore solely serves the regulator. In addition to cutting off the mould circuits in the event of a leak, the Safety system also performs a swift pressure equalization to further minimize water egress at the point of failure. Also, the Safety system is capable of detecting much smaller leaks than the ICW. The systems come in sizes from ½" to 2" and in versions for various media qualities and additives. 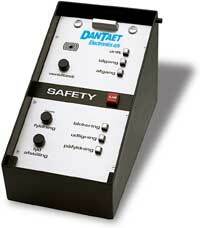 The systems employ DanTaet's patented principles for leakage detection.